The Bass Fishing Team is a group of seasoned student anglers that compete in college bass fishing tournaments on a national level with 2 and 4-year colleges and universities. Last year, the team participated in several national tournament series and gave Calhoun Community College some great publicity. 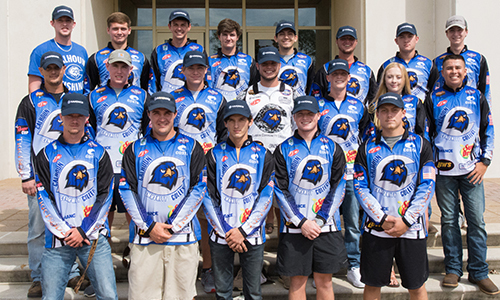 Comprised of 25 active members, they participated in the FLW, BASS and BOAT US college fishing series. Even had one new member transfer here from Arizona to participate on the team. FLW College Series at Lake Guntersville – Chris Lupo and Austen Willard 8th place (we also had boats finish in 18th and 24th place out of a total of 277 boats). Three boats qualified for the 2019 FLW National Championship at that tournament. FLW College Series at Lake Chickamauga – Zane Loveday and Dakota Guzman finished 5th place. Boat US National Championship at Pickwick – Landon Smith and Jordan Thompson 5th place. You can be a part of supporting the award-winning Calhoun Bass Fishing Team! Your donations help the team compete for top ranking in major fishing tournaments. Travel and fuel make up the majority of the team’s expenses. The team survives on local and national sponsors and generous donations from a few benefactors. If you would like to help the team continue to succeed, click the button below to give today! If you have bass tournament fishing experience, we want to speak with you about becoming part of a nationally ranked team. Please contact Meg Graham, Bass Fishing Team Sponsor for more information at 256-306-2835 or meg.graham@calhoun.edu.